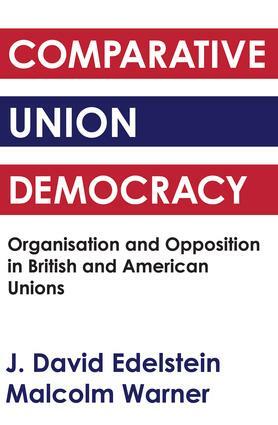 A major empirical study of thirty-one British and fifty-one American national trade unions, this volume provides the background to a new, or­ganizationally oriented theory of union democ­racy. Supported by in-depth studies of the political process in the British Mineworkers' Union and the Engineers' Union, the book develops and illus­trates a general theory of how, in a country with democratic norms, formal organization itself can constrain a tendency toward oligarchy by stimu­lating union competition among full-time officers attempting to rise in the union hierarchy.Comparative Union Democracy is easily the best work on the subject that has appeared in years. It should be required reading for all those interested in organizational government, participatory de­mocracy, generally, as well as in the labor move­ment.